Renee Rosen. Photo by Charles Osgood Photography. Born and raised in Ohio, Renee Rosen has been a resident of Chicago for the last 30 years. If that wasn’t enough to convince someone that she’s a true Chicagoan, her latest novel, “White Collar Girl,” should put all doubts to rest. 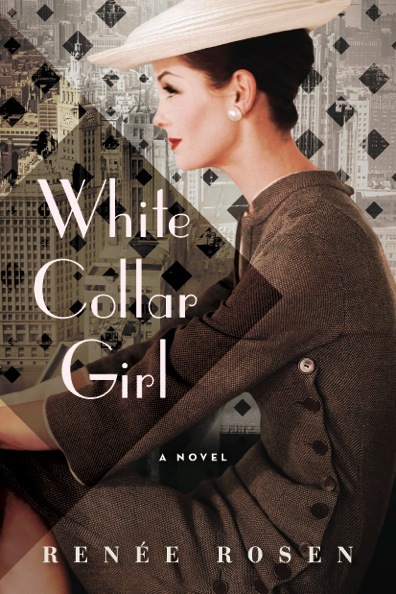 Set in 1955 at the Chicago Tribune, “White Collar Girl” tells the story of Jordan Walsh, a cub reporter who like most female reporters of the time, were relegated to society news. But Walsh finds a way to break through the glass ceiling, using a secret source inside Mayor Daley’s office to break a big story that will change several careers and the lives of several characters in the historical novel. To write her novel, Rosen did a lot of research and was helped a lot by Tribune reporter Rick Kogan and former Tribune photographer Charles Osgood, who vetted the book and introduced her to former Chicago Tribune reporter Marion Purcelli. It was Purcelli who was the biggest influence on the book, having worked in the same timeframe as the fictional Jordan Walsh. While it took Rosen 17 years to write her first novel, the last three have taken about a year each. While she isn’t sure if she’ll continue to keep Chicago as the settings of her novels, she already has written enough to make the short list of great Chicago writers who have written about the place where they live and love. She is currently promoting “White Collar Girl” but stopped to talk to the Chicago Ambassador about her most recent novel, her process of writing novels and her next book — a novel with no title that she just finished the first draft of which focuses on blues music in Chicago, the black migration and Chess Records. CA) You’ve said that you were inspired to write after reading a Sidney Shelton book and thinking, ‘I can do this.’ Did you have a rude awakening when you actually tried? ROSEN) What happened was, I was writing before I was reading. I read a few books, it wasn’t like I didn’t read at all, but it was not the kind of writing that I did. So, I tried writing and in my arrogance thought I could do it. And at 17 I completed my first novel, and it was horrible. I tried to get it published and nothing of course came of it. Then, in my early 20s, I realized that when you start reading really good books it’s amazing how it opens your mind. You realize what’s possible and how far you have to go to get there. CA) Did you ever pick that book up again or do anything with it? ROSEN) No. I did see a copy of it laying around here somewhere. CA) As for “White Collar Girl,” was it easier to research than your previous books because people are still alive from that era? ROSEN) It was easier and harder. It was harder in a sense because people were alive I had to get it right. There are too many people who would know if I was misstepping somewhere. For instance, The Gilded Age, no one is alive from that time period anymore. Not that you aren’t being as factual as you can be, but there was the added pressure that people are going to remember when the air raid sirens went off when the White Sox won the pennant. People remember the horse meat scandal and Summerdale. So it was an added challenge and yet there was more people that I could speak to and get more intimate stories than I would with the other books. CA) In your talk about the book, you presented slides with a lot of historical background. How important is it for the reader to have that background knowledge? ROSEN) I think as you read ‘White Collar Girl’ it’s all kind of laid out there for you. You don’t really need the background. Not everyone who will read it is a Chicagoan and even people from here have told me ‘I didn’t know all that about Daley’ or ‘I didn’t know how Chicago fits into Cook County.’ I sort wrote it in a way that hopefully even if you’ve never heard of Ben Adamowski or didn’t know anything about the Kennedy/Nixon election, you would get it. I think that’s the job of historical fiction, to assume that people are coming at it not knowing a lot about your subject. It’s your job to lay it out for the reader in a way that pulls together the story. CA) You’ve said you pitched “White Collar Girl” to your editor as Mad Men meets House of Cards. How important is the pitch at this stage in your career? ROSEN) What happens at this point is that it’s not really a formal pitch. When I’m finishing up one book, we start to talk about ‘where do I go from here?’ It’s very much a collaborative effort. My editor [Claire Zion] is super smart and I feel like she’s very vested in my career, as is my agent [Kevan Lyon]. So, the three of us will talk about strategically where do I go from here? Then, usually I’ll write a paragraph describing the story. Then I blow it out into a bigger synopsis. Usually by the time we’ve agreed on a subject and a basic direction, there are no words yet. There may be a synopsis and a discussion, but I’m starting with a blank page. CA) Do you start with a setting before the characters? ROSEN) I knew it [White Collar Girl] was going to be another Chicago book. I knew it was going to be about the Tribune, but that was about all I knew. So, once Jordan the main character was formulated, the book basically wrote itself. I really did not know what was going to happen from one chapter to the next. There’s a thread of a mystery that runs through the book that I had absolutely nothing to do with. CA) You said you included some historical events that readers may be familiar with and others you fictionalized. How did you decide which to stay true to and which to take dramatic license with? ROSEN) It just sort of happened. There was no conscious decision making. If something happened on the right timeline, I just stuck with it. But certain things, I’d be like ‘that’s a great scandal, it’s so Chicago,’ but maybe it happened a few years outside of the timeline, so I’d [take dramatic license in those situations]. CA) Do you think Jordan’s experience would be similar if she worked in another industry or is it specific to journalism? ROSEN) I think some aspects would have been across the board in the 1950s. I think women were marginalized. They were secretaries; it was rare for a woman to take a lead position and that was whether you were in advertising or probably in any field at that point. There were not a lot of women in supervisory positions unless it was something like the society page of the paper because no man wanted that role. CA) You’re currently working on a novel that incorporates blues, the black migration and Chess Records. What led to that? CA) How far along are you with that? ROSEN) I just finished the first draft and will probably be turning this book in by March. CA) Any idea of when it will be published? CA) You said something about expanding outside of Chicago for your novel settings. I know the blues book goes down south for a bit. Do you want to stay inside of Chicago for your career? ROSEN) I do have other things percolating in my head that are outside of Chicago, but I do think the blues book with be a nice segue because it covers a larger landscape than just Chicago. “What The Lady Wants” went a little bit into Europe but this really opens the door for a further reach. CA) Are there any Chicago authors that you especially like? ROSEN) Rebecca Makkai a great talent. Stacey Ballis, Kelly O’Connor McNees is amazing. One the my favorite books that she wrote is “In Need of a Good Wife.” She’s a great historical novelist. Amy Sue Nathan, she writes contemporary fiction and I think she’s very good. There are a lot of very good writers here in Chicago. CA) You’re still touring with “White Collar Girl.” How long will you be doing promotional appearances? ROSEN) I have things going on through January and then it will slow down a bit. CA) Do you write every day? Do you have a routine? ROSEN) Normally I do. When I’m promoting, I grab my time when I can. I usually like to write first thing in the morning because that’s when I’m freshest. I’ll write for four or five hours and then take a break because I’m usually emptied out at that point. Then I’ll write again from 2 until 6 or 7 p.m. or something like that. Renee Rosen’s next public appearance will be December 3 at the Chicago History Museum as part of “The Last Speakeasy” event. In addition, on December 12, she will be at the Warren-Newport Public Library in Gurnee. For more information, click here. The Santaland Diaries: Mitchell Fain kills again!